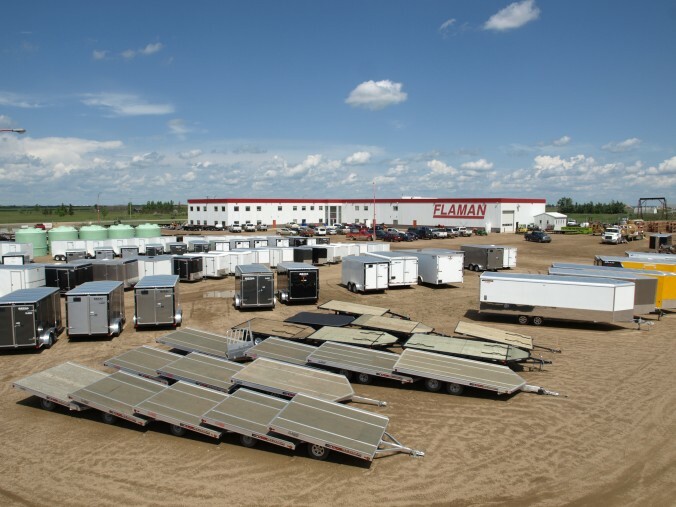 The trailer division in Saskatoon carries a variety of trailers, from lowboy flat deck trailers and highboy flat deck trailers, enclosed cargo trailers and auto hauling trailers, AirTow Level Loading trailers, Ag transport trailers (including sprayer and combine), dump trailers, utility trailers, and tilt trailers, all of which come in either bumper pull or gooseneck configurations. We rent all of the above trailers as well, along with agriculture equipment such as heavy discs, grain vacs, post pounders, mowers and bale carriers. In Saskatoon, we deal in some pretty neat stuff, such as boat docks and lifts, pressure washers and accessories, small chemical sprayers and handlers, as well as the regular equipment that we sell, such as three point hitch equipment, grain and fertilizer bins, augers and conveyors, grain bag extractors and conveyors. We also offer a service shop to fully service your needs, whether it's a trailer that needs new axles or a specific trailer part or farm equipment that needs annual servicing. We also install hitches, brake controls, airbag suspension and anything else you can think of when it comes to towing your load down the road. The Saskatoon location is home to our award winning marketing team, whom are extremely proud to be SABEX and ABEX winners. So come on down and see us, we've always got a pot of coffee and friendly knowledgeable staff, the kind you've come to expect from a company built on the honesty and respect of a family business.